First off, here's the real deal. This is a CG rendering of the vessel from the XBox and PC video game "Halo: Combat Evolved". This is the United Nations Space Command cruiser Pillar of Autumn. 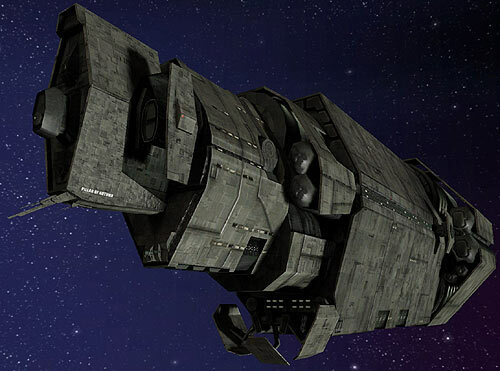 Commanded by decorated Navy officer Captain Jacob Keyes, the Pillar of Autumn is, at over 1 km long, in the smallest class of UNSC cruiser! In 2552, the Pillar of Autumn was under fire from a collection of alien races known as the Covenant, and they forced the Autumn to crash-land on a mysterious, derelict ring-world known as Halo. This is where the model starts. This is a side-view printout I made of the Pillar of Autumn from the game files. At 46" in overall length, it dwarfs the Polar Lights USS Enterprise at the same scale! 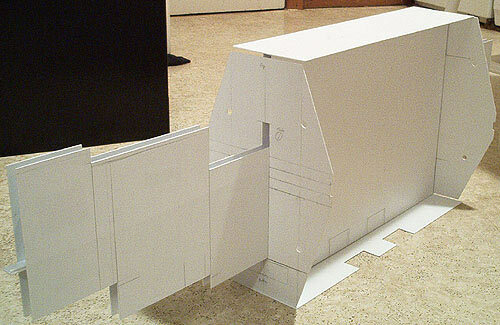 The next hurdle I face is how to reinforce the interior so the nearly 4-foot long model won't sag from the weight. These are some of the diagrams I've assembled and printed out to help me with this model. I'm ready with multi-page views of the Autumn from the top, side, front, back, and bottom. 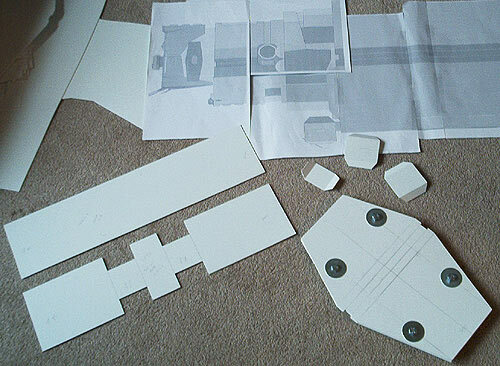 All I need at the moment are the full scale diagrams, my 0.060" sheet styrene, a metal ruler and a pencil. Most of the skin of the ship will be laminated from two thicknesses of the plastic for both strength...and, well... and that's how thick the diagrams indicate. With finally some progress to report, I have begun cutting out some of the Autumn's parts. I decided to start with the single largest segment of the ship, as that will ultimately support the remainder of the model. The first parts made were the 3 angled Navigation panels. They are one piece of styrene each, reinforced to hold the angle. The second parts made were the top and bottom panel of the large section. You can see the bottom section has four notches cut out. If you look back up at the CGI shot of the ship, those notches will be where the Lifepod hatches will be. The inner structural ribs were made all at once to maintain uniformity. 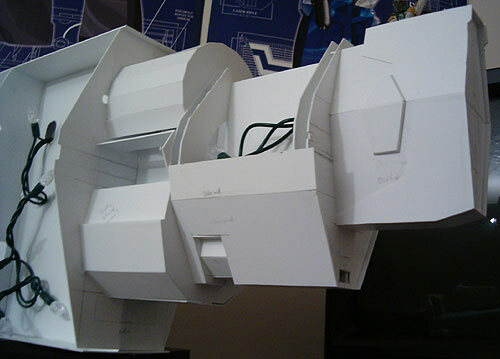 I bolted five sheets of styrene together and cut the ribs out as a unit. The side planking will attach to these ribs. Here's a placed together shot of the ribs and the top and bottom planks. 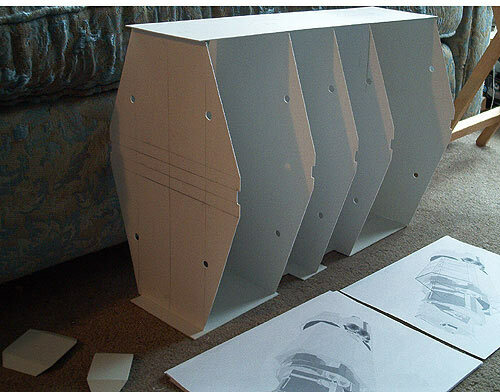 To reinforce the main structure, I will also create a double-planked spine that will attach to the top and the ribs. It will extend aft to the engine section and forward so the rest of the ship can be built upon it as well. And now here's the central spine made from 1/2" blocks of Plexiglas, sandwiched between two large profile shapes of the side of the Pillar of Autumn which will serve as the bracing area for the rest of the panels. I've fitted the bottom and top plates of the large section, along with it's front and back "walls", which I had cut out before. The skeleton is almost complete for the internal structure. Some more of the general shapes are in place now. The hull is really coming together. The first four of the ship's five segments are really helping to define the final shape of the model. 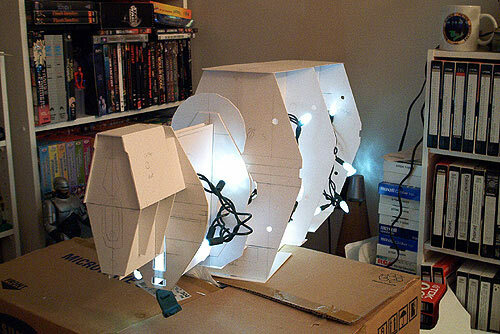 Since I wanted to light this model, my answer was to get a string of 35 LED Christmas Lights. 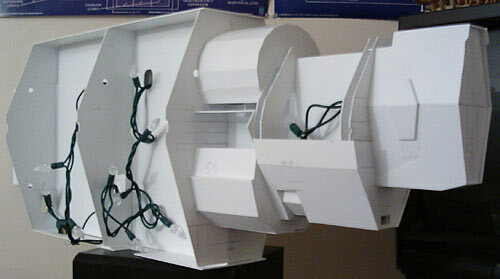 The model was drilled full of holes so I could string all the lights through. I looked to the CGI renders to find out where lighted windows would be and chose as many LEDs as I think would do the job. 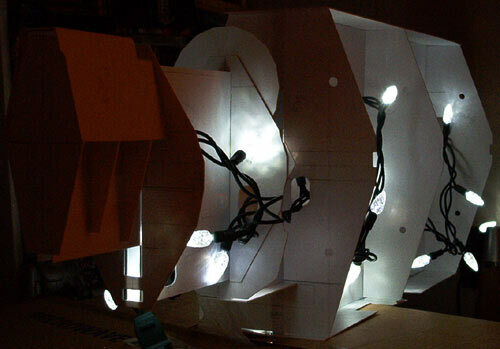 The nice thing about using LEDs is the minimal heat produced since they're not bulbs. I can leave the model lit long term without worrying about the heat buildup. The other separate light source will be the main engines in the back. (Haven't figured out what I'm doing for them yet.). Here's the 'lights-out' version! 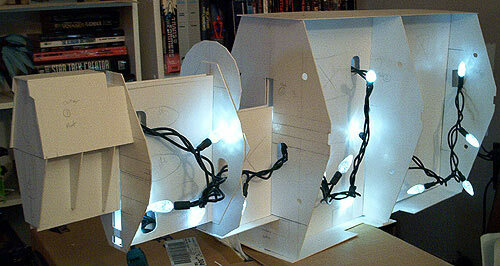 I'm pretty excited about a lit model that didn't require much money or any home made electronics. There will only be one wasted light inside where there are no lights. The LEDs are evenly spaced on the wire so I had to sacrifice one to an enclosed unlit portion. Ah well. I can't wait to see what detail I can put into the bridge, lit up in the lower front of the ship. Finally some progress worth reporting! The Autumn is mainly made up in five distinct sections, so now the first and third sections are mostly together now, and the second section's lower half is now complete. The upper half of section two has the multi-faceted Marathon logo area and wil be difficult to design and that part's the next challenge. Here's a closer shot of the first three sections. Section 1 now has some detail plating defining more of the shape of that section. 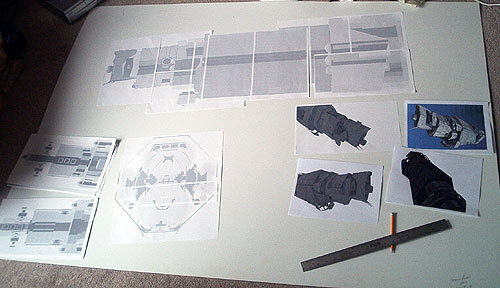 There's also the underlying shape that will eventually house the large panels that stick out of the sides of the hull. You can see at the lower portion of the front of section two the rectangular hole that will eventually be the Autumn's bridge. There is one bulb devoted to that section. I have plans for panels and details of a miniature bridge there, with even the possibly of a crew if what I see in my head can be made in three dimensions. The highlight of section two is the area near the back of it on the bottom. The angled recessed shape there is where the forward set of escape pod hatches are. The open area in the midline of section three will eventually be hexagonal pods so there's no plastic closing that section off at this time. This is the emblem for the Pillar of Autumn. The circle with vertical line symbol also appears on Captain Keyes' uniform and on the sides of the Autumn. This symbol was drawn in Adobe Illustrator and will appear on the display stand for the model. Photos and artwork by Stephen L., Pillar of Autumn design & rendering by Bungie.